I enjoy driving my Prius and living in it during my winter travels, but there are times that a stay in an establishment works better. I have never boondocked in Canada and going to the small town of Parrsboro, NS was not the time to figure it out. The last time I was here I stayed in a B & B and I thought it would be a good choice again. 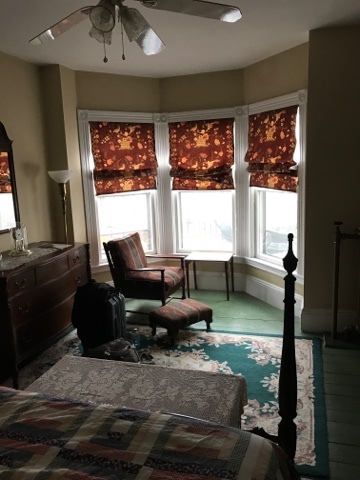 My cousin recommended the Evangeline's Tower B & B right downtown. 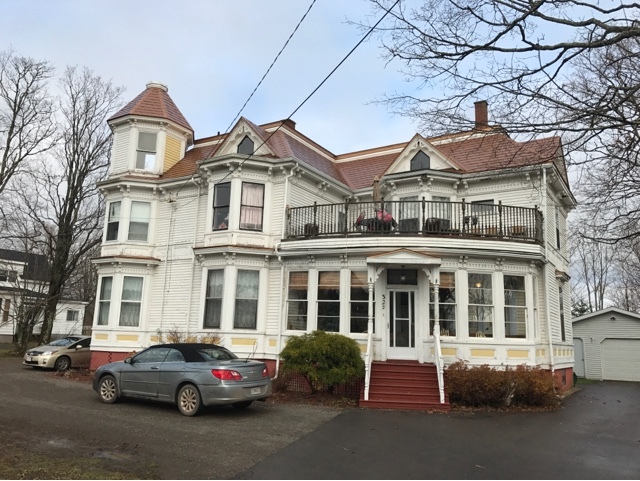 Note that there are no hotel chains in the immediate area with the closest being in Amherst, NS 45 minutes away. I checked out the Evangeline online and called and booked the Gabriel Room that has a private bath in-suite. Being by myself the second floor suite was more room than my needs, but it had a great sitting area near the front windows. There is no in-room TV, opting for a central TV on the first floor guest area. I am not a big TV watcher so this was not a problem. I decided to set up my IPad and watch a TV series online though the house's fast wifi. My room is the room on the second floor right, bay window area. You can see my Prius hiding on the side of the building. I was greeted by the woman who runs the B & B for the owners. She was very friendly and interested in my genealogy visit and knew my cousin from town. There were others that were booked there for the first night (Friday) that were in Parrsboro to do environmental testing in the bay for impact of the recently installed tide water electrical generation station. Above is the sitting area that I enjoyed when I was not roaming. 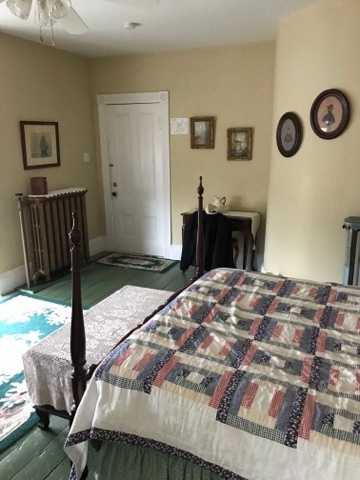 Looking to the entrance door across the well appointed room and the main bed in the foreground. 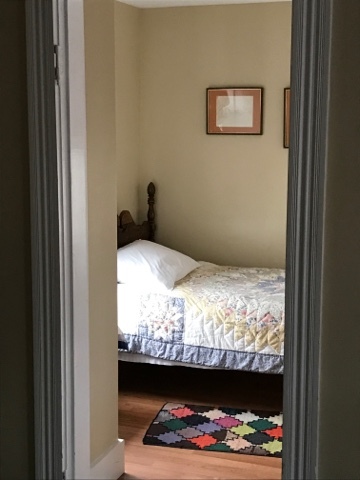 Off to the side is the single bed for the suite. 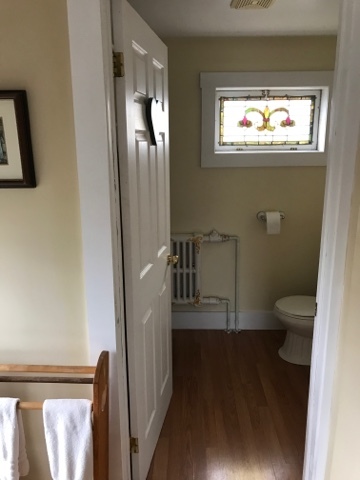 Then through the suite to the bathroom. The dinning room is off the living room with the guest TV and then there is a sitting room as you enter with the check-in desk. It was a pleasant stay with a wonderful host that made for easy conversation. It's proximity to the small downtown is great and made my walk to the Bistro for a couple beers a non-driving event. 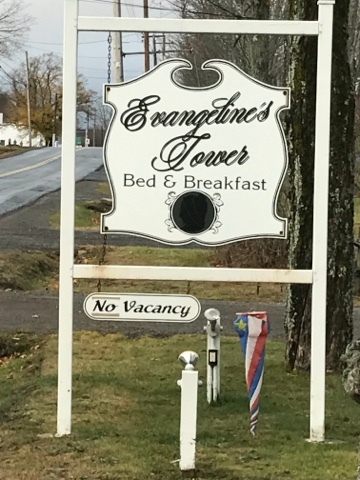 I would recommend Evangeline's Towers B & B for a visit to the area. Summer time is high tourist season so you should plan ahead.